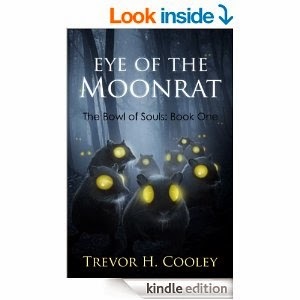 Eye of the Moonrat by Trevor H.Cooley. Justan was raised on the outskirts of the Dremaldrian Battle Academy. He watched his father ascend the ranks within the academy to become one of the most respected warriors in the kingdom. The only thing he has ever wanted is to become an academy student and follow the path of his father. Unfortunately, only the best can enter the academy and Justan is a horrible fighter. Everyone tells him that he is more suited to scholarly work than swordplay. In desperation he hurls himself into training, eager to overcome the doubters and walk into the academy triumphant, unaware that secretive powers plot to disrupt his plans. This is your traditional coming-of-age fantasy novel; involving a young - often immature and naive - character, who undergoes a journey of self discovery through trials and tribulations, that eventually transforms them to the necessary hero/heroine of the story that saves the day. I hope I'm not coming across as cynical, as I do enjoy a good coming-of-age fantasy. Honestly. Justen - the hero of the story - is the son of a renowned warrior. And, of course, he wishes to follow in his father's footsteps. The only problem is that he's not very good at fighting. After failing his entrance exams that would have admitted him into a renowned fighting school, he's taken under the wing of a skilled female warrior, Jhonate (yes, she's beautiful). She acts as his mentor and eventually close friend (not too 'close', yet). The first half of the book delves into the day-to-day routines of Justen's sword training. I realise that training is a big part of 'coming-of-age fantasy', but personally I've grown tired of reading them. The author, Cooley, does go into quite a lot of depth. Too much for my liking, and I did find myself wondering when the story will progress. Well, the story did eventually move on, when it's discovered that Justen has precocious talent in magic (of course he does). And so just as Justen has passed all the tests that would have finally allowed him to enter the sword academy and fulfil his life-long dream, he's sent packing to a magical one instead. So, as a reader that's just sifted through half the book going through his sword training, we're about to go back to square one. Let me tell you the thought of going through that again wasn't exactly overwhelming me with excitement. But before that, Justen has to reach the magic school. The journey from A to B, takes almost another half of the book. The interlude was filled with the usual series of mishaps and adventures - which only filled me tepid interest and not enough to inspire emotions of thrill and anticipation. Rather, I just wanted the story to hurry up so that Justen can reach the magic school, and at some stage I was left wondering if he'll ever get there. With just about 10%* of the book left, he did finally reach the school. Hurray!! *I may be overdramatising the 10%, but it was near the end. I'm trying not to be harsh here, it's just that my frustration at where the story went from A to B to C and the slow pacing of it....has bubbled over the cauldron and resulted in me venting my annoyance. It was nice seeing Jhonate develop from the hard taskmistress she was originally, to a deeply caring friend (that hints at more). I enjoyed reading her character evolvement and I'm a little disappointed she wasn't in there more. I also enjoyed reading about the bond that developed between Justen and Gwyrtha - a special type of horse that thinks for itself. I've always held a soft spot when characters form a bond with animals. I guess it all stemmed from LOTR's Gandalf and Shadofax. The author can definitely write. I had no problems with the writing; the sentences flowed and the story was well embellished. It was clear in my mind what was happening. Also for a self-pub book it was immaculately edited. I found no typos or grammatical mistakes at all. If you're in search of a well written YA coming-of-age fantasy, then you can do a lot worse than giving this a try. The problem for me was that the story never really gripped me by the shoulders and captivated me. But, the majority of reviews on Amazon strongly disagree with my views. So take my opinions however you wish it. And on one last note, if you like a story of a young man that never takes no for an answer and always tries his hardest, then I recommend this. There are a lot of qualities in Justen that we can all endeavour towards.